Wisconsin Governor Scott Walker has just signed into law legislation that makes Wisconsin, birthplace of unions, a right to work state. It means union members can opt out of paying union dues, which along with the existing ban on government employee collective bargaining will cause further shrinkage of union membership, and thus less campaign money for Democrats to oppose Republican candidates. It is hard to believe, but most of prospective presidential candidate Walker's antipathy seems to be towards teachers unions and higher education, in particular. He has even proposed to cut the University of Wisconsin budget, while downsizing its mission from that of higher education to that of supplying "workers," whoever they might be? Walker's new budget proposal would slash $300 million from the University of Wisconsin system over the next two years. That's a 13 percent reduction in state funding. The reduced spending might be explained by the poor performance of the Wisconsin economy since he took office -- an economy now ranked below all other comparable Midwestern states. But he also proposed changing the university's focus on the pursuit of truth, known as the "Wisconsin Idea," to a more mundane focus on "workforce needs." What does that mean? The University of Wisconsin's mission statement reads in part: "Inherent in this broad mission are methods of instruction, research, extended training and public service designed to educate people and improve the human condition." What is wrong with that mission statement, you ask? It speaks to a well-educated mind is Walker's problem, apparently. If Walker gets his way, that sentence, along with: "Basic to every purpose of the system is the search for truth," would be entirely cut from the charter. Walker also seeks to cut statements reinforcing the university's commitment to working with out-of-state institutions and its prioritization of "programs with emphasis on state and national needs." In its place, Walker proposes language stating Wisconsin only provides a state education because it is constitutionally required and among its top priorities are meeting "workforce needs." So the U. of Wisconsin should be down-sized to a trade school? On reflection, Walker's anti-education agenda fits right in with the current Republican Party's prejudice against modern education in general, and scientific knowledge based on empirical facts in particular, such as the denial of global warming. Republicans have even proposed abolishing the Department of Education, a cabinet position, which helps to keep their own supporters in the poorer red states literally ignorant of those knowledge-based facts that would better their lives. It was in 2011 that Walker pushed through a law, Act 10, that slashed the power of public employee unions to bargain, and cut pay for most public sector workers. As a special slap to teachers, Walker exempted the unions of police, firefighters and state troopers from the changes in collective bargaining rights but not educators. Teachers protested for a long time, closing schools for days, but the law passed, and the impact on teachers unions in Wisconsin has been dramatic: according to a piece by Washington Past columnist Robert Samuels. The state branch of the National Education Association, once 100,000 strong, has seen its membership drop by a third, and the American Federation of Teachers, which organized in the college system, has seen a 50 percent decline. The effect on Wisconsin's economy has been even more dramatic. The latest comprehensive state employment data from the U.S. Bureau of Labor Statistics and the Quarterly Census of Employment and Wages (QCEW) reveals that Wisconsin continues to lag both the national rate of job growth as well as the rates of employment gain in most other states. Between December 2012 and 2013, Wisconsin gained 26,816 jobs, posting an annual employment growth rate of 0.98 percent, significantly trailing the national job growth rate of 1.75 percent during the same period. Thus, Wisconsin's year-over-year job growth in fourth quarter of 2013 was just slightly over half the national rate -- a level of under performance that has been consistent since 2011. Overall, Wisconsin ranked 37th among the 50 states in the rate of total employment growth between December 2012-13. Wisconsin trailed every single neighboring Midwestern state (Illinois, Indiana, Iowa, Michigan, Minnesota and Ohio) in year-over-year employment growth between December 2012-13. 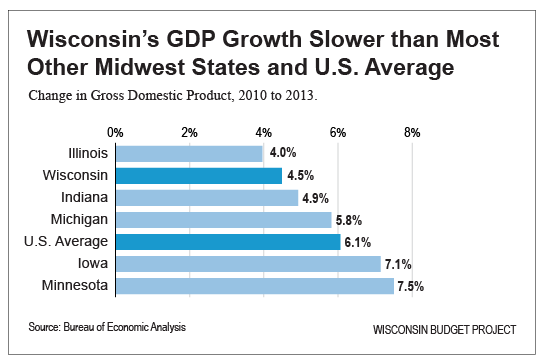 Walker is destroying Wisconsin's economy, in other words. And this man wants to run for President of all 50 states?